Picatinny Arsenal was tasked to create a nuclear capable artillery piece in 1949. Robert Schwartz, the engineer who created the preliminary designs, essentially scaled up the 240mm shell (then the maximum in the arsenal) and used the German K5 railroad gun as a point of departure for the carriage. (The name "Atomic Annie" likely derives from the nickname "Anzio Annie" given to a German K5 gun which was employed against the American landings in Italy.) The design was approved by the Pentagon, largely through the intervention of chief of the Ballistics Section of the Ordnance Department’s Research and Development Division, Samuel Feltman, and a three-year developmental effort was begun. The project proceeded quickly enough to produce a demonstration model to participate in Dwight Eisenhower's inaugural parade in January of 1953. The cannon was transported by two specially designed tractors, both capable of independent steering in the manner of some extra-long fire engines. Each of the tractors was rated at 375 hp, and the somewhat awkward combination could achieve speeds of 35 miles an hour and negotiate right turns on 28 ft wide, paved or packed roads. The artillery piece could be unlimbered in 15 minutes and then returned to traveling configuration in 15 minutes more. On May 25, 1953 at 8:30am local time, the Atomic Cannon was tested at Nevada Test Site (specifically Frenchman Flat) as part of the Upshot-Knothole series of nuclear tests. The test--codenamed Grable--was attended by then Chairman of the Joint Chiefs of Staff Adm. Arthur W. Radford and Secretary of Defense Charles E. Wilson; it resulted in the successful detonation of a 15 kt shell (warhead W9) at a range of 7 miles. This was the first and only nuclear shell to be fired from a cannon. Subsequent to the successful test, there were at least 20 of the cannons manufactured at Watervliet and Watertown Arsenals, at a cost of $800,000 each. They were deployed overseas to Europe and Korea, often continuously shifted around to avoid being detected and targeted by opposing forces. 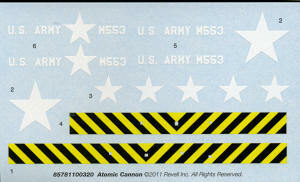 Due to the size of the apparatus, their limited range, the development of nuclear shells compatible with existing artillery pieces (the W48 for the 155mm and the W33 for the 203mm), and the development of rocket and missile based nuclear artillery, the M65 was effectively obsolete soon after it was deployed. However, it remained a prestige weapon and was not retired until 1963. Of the 20 built, 8 are on display in various parts of the US. 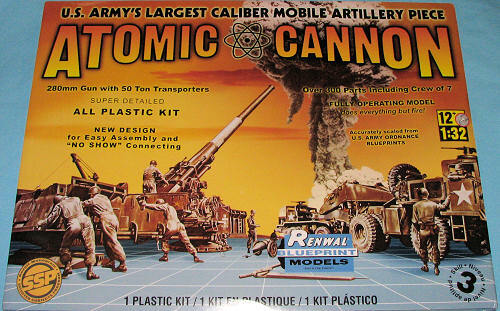 One of the most highly sought kits from the 1960s is the Renwal Atomic Cannon. Renwall issued this kit twice; once in a white background box, and once in the Blueprint box. Revell purchased Renwal in, I believe, the late 1960s and reissued this kit in their History Makers series of the early 1980s. Since then, all of these boxings have been commanding major collector's prices. Now, Revell has reissued this no longer rare kit in the old Renwall Blueprint box motif. As one would expect of a kit of this age, many of the parts managed to detach themselves from the sprue during shipment. This seems like a standard problem with kits originally designed in the late 1950s and through the 1960s. Thanks to the limited use of the molds, the quality of the parts is very good indeed. I found no flash on the parts nor any depressed area as is so often the case with older molds. This will not be a small kit. The gun frame itself without the tractors is in the 18 inch range and the overall kit should be around 2.5 feet, so set aside some shelf space. Despite its age, the detailing is actually quite good. There are a number of gear sets to be assembled so that the gun can move in azimuth and elevation. In fact there are several 'do not cement' sections in the instructions. The gun barrel builds up of several pieces in several sections. There are also several lock pins as part of the kit that should not be cemented if one wants to display the gun in firing position. Folding work stands are located along the side of the gun, most of which just snap into place. Half of the 13 construction steps are for the front and rear tractors. The se have fairly complete interiors for the time and there are driver figures included as well. Both have similar and rather nice suspensions to which are attached the gear housings and four piece tire/wheel assemblies. There are no clear parts with the kit (something quite typical of kits of this era), though one could install sheet acetate for this purpose. In terms of figures, which are actually quite well molded, there are two drivers, a crew commander, loader and an additional crewman. There is also a shell trolley and shell. I did not see the Geiger counter mentioned by the LHS owner prior to the kit's release. Instructions are quite well done with generic paint references and decals for one vehicle. These are nicely printed and should provide no issues in application. Builders will love the reissue of this kit. The LHS ordered a dozen and had most of them sold before they arrived. Collectors will find the value of their over-priced purchases to have plummeted over night. Such are the chances one takes when collecting. Considering its size, it is very reasonably priced as were one of the other 'big names' to have produced this kit, it would have 900 parts and cost at least $150. Get yours now if you plan on getting one at all as I can see this one selling very quickly.